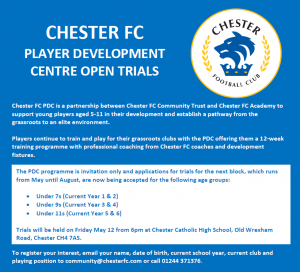 Trial applications are now open for the next Chester FC Player Development Centre (PDC) programme for talented footballers of primary school age. The PDC is a partnership between Chester FC Community Trust and Chester FC Academy that will provide increased opportunities for players to train in a professional environment designed to help them reach their potential. Players continue to train and play for their grassroots clubs with the PDC offering them additional coaching from Chester FC coaches in line with The FA’s four corner model and opportunities to take part in development fixtures. The PDC provides a route into the Chester FC Academy for players who display exceptional ability and a number of players progressed on this pathway during the pilot programme. Trials will be held on Friday May 12 for the following age groups: U7s (current Year 1 & 2), U9s (current Year 3 & 4) and U11s (current Year 5 & 6). Jim Green, chief executive of Chester FC Community Trust, said: “Following the success of the PDC pilot and positive feedback from players and parents, we’re very pleased to confirm details of the next programme. “The PDC aims to support young players in reaching their potential through creating an environment to challenge them by bringing together talented players from across the local area and providing quality coaching. Assessments for U7s, U9s and U11s will take place on Friday, May 12 from 6pm to 7pm with registration from 5.30pm. The venue is Chester Catholic High School, Old Wrexham Road, Chester CH4 7HS. The PDC works closely with Chester FC Academy, enabling coaches to identify and monitor talented players and creating a pathway for exceptional players to progress. To register your interest, email your name, date of birth, current school year, current club and playing position to community@chesterfc.com or call 01244 371376. 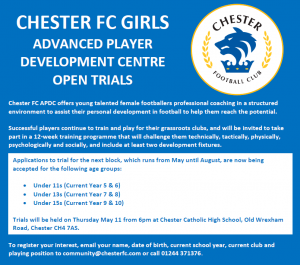 Chester FC Girls Advanced Player Development Centre (APDC) is inviting trial applications from young talented female players at U11s, U13s and U15s. The APDC is designed to assist players in their personal development in football and to help them reach their potential, bridging the gap between grassroots football and FA Regional Talent Clubs. Players receive professional coaching in a structured environment over 12 weeks and play development fixtures while continuing to train and play for their grassroots clubs. Trials will be held on Thursday May 11 for the following age groups: U11s, U13s and U15s. Jim Green, chief executive of Chester FC Community Trust, said: “We launched the APDC in October 2016 in partnership with Cheshire FA to provide increased opportunities for talented female players and help them reach their potential while supporting the excellent work of grassroots clubs. “We were delighted with the response to the APDC and the level of talent underlined the quality of girls football locally. The players demonstrated outstanding commitment to the programme and performed very well in development fixtures. Prospective players living within 60 minutes travelling time of Chester are encouraged to register for the trials. Please note the APDC is for females who are demonstrating a high level ability playing within mixed or girls club football teams. Those successful will be invited to the APDC to take part in programme which will challenge them in line with the FA’s four corner model (technically, physically, psychologically and socially). Players continue to train and play for their grassroots club and receive additional coaching on a Thursday evening and play a minimum of two development fixtures. Assessments for U11s, U13s and U15s will take place on Thursday, May 11 from 6pm to 7pm with registration from 5.30pm. The venue is Chester Catholic High School, Old Wrexham Road, Chester CH4 7HS. Chester FC is hosting a Girls’ Football Festival at the Lookers Vauxhall Stadium on Friday, May 5. 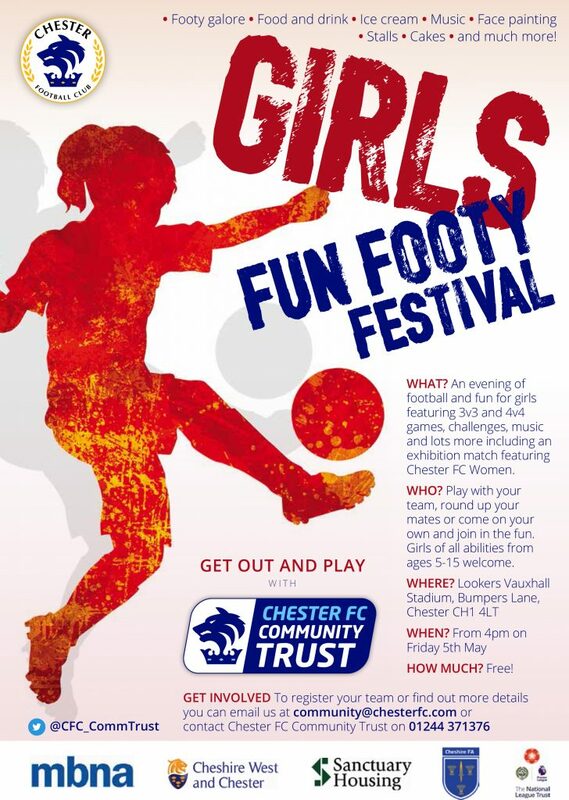 The free festival starts at 4pm and is open to girls aged 5-15 and will be packed with football and fun featuring 3v3 and 4v4 games, challenges including quick feet and rebounders and an exhibition match between Chester FC Women and Burscough Dynamo Ladies. To add to the festival atmosphere, there will be a BBQ, ice cream, face painting, stalls, music and much more. Grassroots clubs can register teams for the small-sided competitions and girls are also welcome to round up their friends to create their own teams or simply turn up and join in the fun. Jim Green, chief executive of Chester FC Community Trust, said: “We’re really excited about the Chester FC Girls’ Football Festival and we hope it will be a fun, interactive experience both for girls new to the game and regular players. “We’re inviting clubs from across the area to enter teams to play in small-sided games on the stadium pitch but girls don’t need to be attached to a club to take part; you can get together with friends from school to form your own team or register as an individual and join one of our Chester FC teams for the festival. “The festival will offer girls the opportunity to play football in a relaxed and engaging environment and supports our commitment to developing the female game and the FA’s Gameplan for Growth. To register as a team or individual for the festival or find out more details email community@chesterfc.com or contact Chester FC Community Trust on 01244 371376. Traders and organisations interested in attending the festival as stallholders should email community@chesterfc.com. Chester FC are supporting a national initiative aiming to encourage more women to attend live football matches. The visit of Woking on Easter Monday, 17th April has been designated a Women at the Game match with the Blues running a special ticket promotion for the game and hosting a pre-match reception for female supporters. Women at the Game is the brainchild of Jacqui Foster, who wanted to create a more welcoming and supportive environment for women attending live football, and particularly those watching a live match for the first time. Jacqui, who supports Altrincham, was diagnosed with terminal cancer in February 2015 and used money that friends raised for her to launch the campaign. She will be attending the game on April 17th with the Blues announcing a special Women at the Game ticket for any females who wish to attend the game priced at £10. Jacqui said: “I am delighted that Chester FC, a community club close to my heart have decided to hold a Women at the Game event. Before the game the club will welcome female fans to a reception with pre-match refreshments available including teas, coffees and cakes. Chester FC Women’s players will be on hand to meet and greet supporters, answer any questions they may have and take them into the ground to watch the game alongside fellow female fans. Anne Salmon, a director of City Fans United, has worked with Jacqui to plan the event and said: ““It has been a pleasure planning this event with Jacqui; she is super organised and came to the meeting armed with lots of helpful information. Women at the Game tickets must be ordered in advance via community@chesterfc.com and can be collected on the day of the game in the Community Hub marquee. For more information about the Women at the Game match contact the club on 01244 371376.